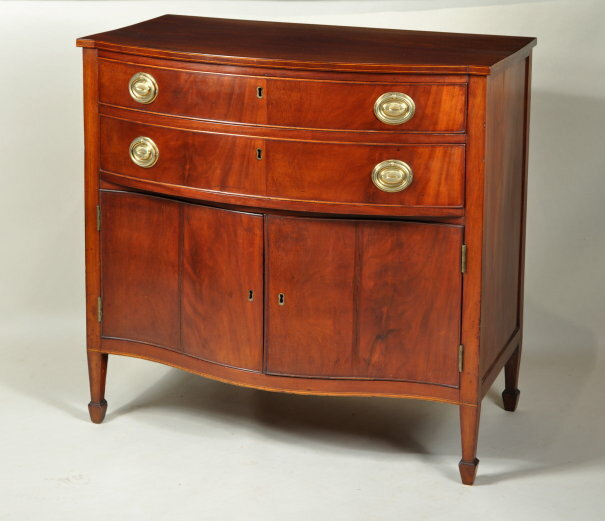 Very rare hepplewhite bow front mahogany serving cabinet, with bow front line inlaid top above two conforming long drawers and two serpentine recessed cabinet doors, raised on tapering legs with spade feet. Salem, Mass. circa 1785-95. Provenance: C.L. Prickett, Yardley, PA; Thomas Schwenke, Inc. 1985; Princeton NJ Private Collection; Ex. Collection: Philip Hammerslough. 36" wide, 33 3/4" high, 21 1/2" deep.